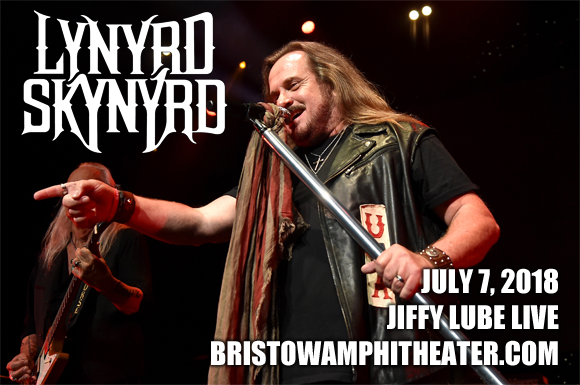 45 years after the release of their smash hit debut album "Pronounced 'Leh-'nerd 'Skin-'nerd," Southern rock pioneers Lynyrd Skynyrd are headed to Jiffy Lube Live on Saturday 7th July 2018! The "Sweet Home Alabama" icons embark on their final tour this year, dubbed the Last of the Street Survivors Tour, and will be performing songs from their legendary back catalog for this very special show! American Southern rock band Lynyrd Skynyrd made their name as pioneers of the genre throughout the 1970s. Breaking into the mainstream nearly ten years after their formation with the release of their self-titled album (subtitled "Pronounced Leh-nerd Skin-nerd"), the band found success with the single “Freebird”. After a stint touring as the opening act for The Who's Quadrophenia Tour, the band released a follow-up, the multi-platinum-selling 1974 album Second Helping, which launched the hit single “Sweet Home Alabama,” bringing them international fame. The band were at the peak of their success in 1977 when disaster struck and they lost frontman Ronnie Van Zant, guitarist Steve Gaines, backup singer Cassie Gaines in an airplane crash. The band took a ten year hiatus, but in 1987 the remaining members re-formed with a new line-up, and they have continued to tour and record ever since. This year, the band will embark on their farewell tour.